In the boxes: Chawanmushi, veggie, sliced orange, & homemade ngoh hiang. 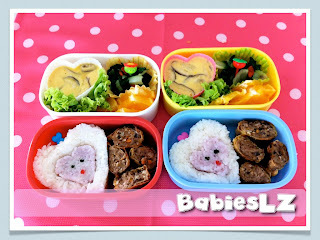 Another attempt in making Valentine's bento but failed again... This was totally not what I want. *sob* I used edible food marker on the features. Nevertheless, my babies have been very sweet to appreciate what I have been preparing for them. 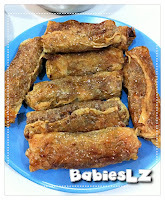 My first homemade baked ngoh hiang! Thanks to my friend, Jasmine, for sharing her mom's recipe with me. It was delicious!